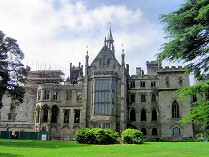 Today marks the first day of the 2005 closed season at Alton Towers. Ironically, the park will still be open for another week, but only with limited hours and a limited selection of rides available. Adrenaline Week sees 10 rides (Rita - Queen of Speed, Nemesis, Oblivion, Air, Spinball Whizzer, Corkscrew, Ripsaw, Submission, Runaway Mine Train and Duel) open between 12pm and 6pm, for an entry price of £10 for adults and £5 for children. There are also Winter Weekends throughout the closed season - check out our earlier news stories for more information. The park will reopen fully on April 1st 2006, with an updated attraction on offer. Out goes Toyland Tours, in comes Charlie and The Chocolate Factory. If you need to return to your vehicle, make sure you get your hand stamped on hard as you leave the park.